News that Giancarlo Fisichella has crashed the Force India car in testing at Silverstone today piles yet more misfortune upon a team that has had plenty already this season. It would be understandable if supporters were to become despondent at this stage, with the team generally occupying the tail end of the grid and struggling to improve. But all is not quite as bad as may seem. After a surprisingly good start to the season, Fisichella has dropped back a bit as other teams found extra pace but Adrian Sutil seems to have overcome his initial problems and is now as quick as his team leader. Both drivers are beginning to finish races, too, and this bodes well for a better performance in the later races. In fact, the team's results are made to look worse by the demise of Super Aguri a few races ago. This leaves Force India as the smallest team on the grid and with a mountain to climb to start impacting the midfield. When one compares their performance with Honda's, it has to be said that they are very close to respectability. Their greatest strength is, of course, Mike Gascoyne, the chief technical officer. With a long history of bringing teams into contention, he ensures that Force India will get there sooner or later, other things being equal. And he remains optimistic, pointing out that they have some major aerodynamic upgrades to introduce before the British GP. Vitantonio Liuzzi was encouraged by the effectiveness of those tried in testing yesterday and Fisichella too said that the car had been greatly improved. It is unfortunate that the wind caught out Fizzy in Becketts, resulting in a big impact with the barriers and extensive damage to the car as a result. It never rains but it pours, they say, and teams that are struggling seem to have more than their fair share of bad luck. Force India do seem to be weathering the storm, however, and are still upbeat about their chances of catching the rest this year. Team owner, Vijay Mallya, continues to be realistic in his assessment of the team's future and is certainly not discouraged. There is certainly no weakness in the power plant, at least, the Ferrari engine being rumored to be the most powerful at the moment, and Toro Rosso doing well enough with it in the hands of Sebastian Vettel. And that could be the team that Force India should be aiming at, Honda being so unpredictable and variable in performance. It will not happen overnight but I would not be surprised to see Force India beginning to get into the midfield later in the year. And that will make competition even fiercer in a year in which differences are measured in thousandths of a second. Ferrari and McLaren may appear untouchable but the battle behind them is closer and more cut-throat than it has been for years. What do you make of the rumour that Force India will be running with Honda power next year? It sounds like Ross Brawn is getting over his loyalty to the Red team. It makes a lot of sense for Force India to pay $10 million a year less for Honda's engine/Kers unit. But could this be a case of you get what you pay for? Didn't Me say that the Honda sounds like a bag of rocks? Might cost a little more, but if I was Mallya I'd be sticking with the Ferrari engines, at least for now. Sounds like Honda want to make Force India their test mule, ergo the basement bargain prices for the engine-KERS package. A very astute move by Ross, who as Arnet said, is proving he's gotten over his loyalty to Ferrari (but Schumi and Todt no longer playing active roles in the team must have helped Ross in his getting-over-it stage). I doubt the story, actually. It's not just a matter of saving money by paying less for and engine/KERS package, there's the matter of preparing the chassis for the new engine, more time and money wasted. Mallya may be thinking about it but he will probably turn it down. 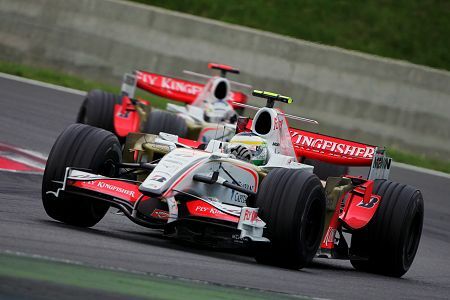 Besides, Force India are contracted to Ferrari in 2009, and that includes their KERS system (the deal Spyker originally struck with Ferrari being a three-year deal. The penalty Ferrari would extract for breaking the contract early would be substantial. Besides, the Ferrari engine is a fair bit quicker - which will be particularly important in 2009, when Force India intend to be in the thick of the midfield instead of tagging along at the back of it. all of these are respected folks, all are expected to work miracles but ....... where's their performance? We all had high hopes for Red Bull, but it's been two + years and their recent success has been due to Webber's improvement and Coulthard's LUCK! The slackards in F1, Toyota, are about to overtake Red Bull. The 'independent' Williams is on par with the Red Bull. The fabled Newey isn't so fabled in my book and Gascoyne and Braun haven't made ANY positive move in their teams. Am I right ....... or just impatient? And if impatient.......WHEN will these teams become competitive? I'd have to argue with you on Mike Gascoyne, Number 38 - he and the team of people he's been gradually recruiting around him have got Force India about 1.5 seconds closer to the pack than Spyker were last year. This is considerably more relative improvement than any other team has managed this year. Especially good given that a) the regulations are restrictive and b) part of the team's efforts were on 2009 (and an increasing amount as the season has gone on - Force India now has only one wind tunnel set up for 2008, and after Hungary that'll probably get switched to 2009 as well). Maybe the reason for the improvement being more like Williams' and BMW's than Red Bull's and Honda's is because Mike has figured out that you need a team and that it needs gradual, organic improvement (which I think is the main point Number 38 was getting at - the team is more important than its leader). As usual, Toyota are a special case - they figured out the importance of the team going in, but forgot that the chemistry between individuals in the team is important, so it's only now that they don't have parts of the group clashing with other parts (as far as I know; there may still be underlying tensions, but they're not getting in the way nearly as much as before). As for the "Am I right... ...or just impatient? ", that's a difficult one. I would argue that you need three years to assess a team properly, but Red Bull have had those three years and are still treading water (albeit at the fairly high level they started at). So short of a major shake-up, 5th best team is probably as high as they will ever go. It's also worth noting that relative improvement in F1 is zero-sum - if one team is improving, that improvement will translate into falling behind the same amount spread between other team(s).